Here we continue an exchange between His Divine Grace A.C. Bhaktivedanta Swami Prabhupada and the poet Allen Ginsberg. It took place on May 12, 1969, in Columbus, Ohio. Allen Ginsberg: Your Divine Grace, my original question was, Is the complicated ritual and the Sanskrit language are they going to keep people from accepting what you're giving. Srila Prabhupada: No, no. We are translating, presenting everything in the English language. All our books are being published in English. Our magazine is in English. Allen Ginsberg: But the question is, Is the mode of life that you are proposing adaptable to many, many, many people? Srila Prabhupada: To that I say that this Krsna culture is not something that many, many people can immediately accept. Allen Ginsberg: Yeah. But there is a thirst felt by many, many people for an alternative answer, for a better alternative system. Srila Prabhupada: Yes. So if people are actually thirsty if they are actually thirsty then they can adopt this system given by the Supreme Lord. What is the difficulty there? There is no difficulty. So many American boys and girls have already adopted it, and they are not feeling any difficulty. They are feeling relief. In what respect is chanting Hare Krsna difficult? You are chanting. Srila Prabhupada: It is all in Sanskrit. What difficulty are you feeling? Allen Ginsberg: I don't feel too much difficulty, except aesthetically I do feel a difficulty. Yes, there is. The difficulty I feel is that there should be some flower of the American language to communicate in. Srila Prabhupada: Therefore, we are seeking your help. Allen Ginsberg: Hm. Well, I haven't found another way. I still just stay chanting Hare Krsna. Srila Prabhupada: That is also my view. I have come to America with this view: that America is at the summit of material civilization they are not poverty-stricken, you see? and yet they are seeking after something. Therefore, I have come to offer, "You take this. You'll be happy." That is my mission. And if the Americans take this Krsna consciousness seriously, then all other countries will take it, because America is leading at the present moment. So exalted persons like you should try to understand. What is the difficulty? There is no difficulty. Chanting Hare Krsna anyone can chant. Even the little child is chanting. So, you were asking, How can this mode of living attract many people? Srila Prabhupada: Philosophy is here. We are teaching Bhagavad-gita. We are talking on Bhagavata philosophy. We are talking on Lord Sri Krsna Caitanya's philosophy. Allen Ginsberg: And you have a daily ritual. So my question is this: Is the Caitanya-Krsna ritual, as you have it here in this house and in the other ashrams is this something that a large mass of people can enter into? Srila Prabhupada: In time, yes. Why not? Srila Prabhupada: Yes. This we have already seen. Virtually all my students are Americans. And Krsna consciousness is spreading. Allen Ginsberg: Yes, but what it requires is an adaptation to Indian dress and . . .
Srila Prabhupada: No, no. Indian food it is not Indian food. Are you not eating fruits? Srila Prabhupada: Vegetables you may simply steam, if you like. That doesn't matter. It doesn't matter whether you take our specific taste. No. That is not the program, that to become Krsna conscious you have to change your taste. No. We say what Krsna says in Bhagavad-gita. Patram puspam phalam toyam yo me bhaktya prayacchati: "Anyone who offers Me with devotion these vegetables, fruits, flowers, milk I accept that." So we are determined to satisfy Krsna, and therefore we are selecting foodstuffs from these groups. And these foodstuffs you are already accepting. Don't you take vegetables? Don't you take fruits? Don't you take grains? So where is the new item? Now, insofar as cooking is concerned, you can cook according to your own taste. But the food groups must be these. Not flesh. Because Krsna does not say, "Offer Me flesh." This, very simply, is our program. And you are already eating grains, vegetables, and fruits, and you are drinking milk. So where is the difference? I don't find any difference. Allen Ginsberg: Well, I suppose not. You could say there is no difference, because the food is basically the same materially. It's just a question of the style. Srila Prabhupada: Yes. My style and your style may be different. That's all right. In any event, to maintain health and keep body and soul together, you require eating, you require sleeping, you require mating, you require defending. We don't say that you don't do this. Arjuna wanted to be nonviolent and not engage in defending: "Oh, what is the use of fighting?" Krsna said, "No. It is required. You should." Defending is part of this Krsna culture. So where is the difference? There is no difference. Simply we are adjusting things so that you may become truly happy. Any intelligent man will accept this cultural idea. We are not prohibiting things, but rather, we are adjusting things. So there is no difficulty. Intelligent persons like you should try to understand and take this idea and distribute it, because your country is in want of this. Allen Ginsberg: But there is a limit to how much the pronunciation of Krsna will spread, I think. There's a limit. Srila Prabhupada: Hmm. No limit. You can pronounce Krsna in any way. For instance, K-r-i-s-h-n-a. You can pronounce Krsna in any way. Niyamitah smarane na kalah. No hard and fast rules, no limits. Allen Ginsberg: The limit is people's prejudice. 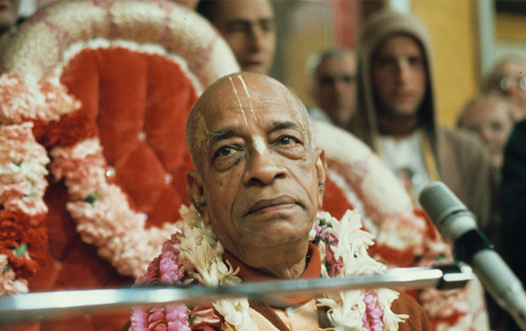 Srila Prabhupada: We don't say, "Why are you chanting Krsna like this?" We never say that. We simply say, "Please try to chant Krsna." Allen Ginsberg: Or let us say there would be a limit until the word Krsna became as common in English as any other English word. Srila Prabhupada: It is already in the dictionary. In all dictionaries you will find Krsna. What more do you want? Allen Ginsberg: Something that will not disturb truck drivers. Disciple: They can say Christ. They can say Krsna. It is the same. Srila Prabhupada: I have read one book, the Aquarian Gospel, wherein it is explained that Krist means love. Christ means love. And Krsna also means love. So from Krsna this word Krist has come. And in India sometimes people say Kristha. Instead of Krsna, they say Kristha. And in various regions has come the word Kestha. Generally, instead of pronouncing very precisely Krsna, if somebody's name is Krsnacandra, they say, "Hey, Kesthara." Allen Ginsberg: Where is this? Srila Prabhupada: In India everywhere. Kestha. So Kestha, Christ, Krist, Kristha, or Krsna they're in the same group. Pronouncing Krsna is not difficult.